Technical Car Experts Answers everything you need: code RV1 on raypak 2100 digital POOL HEATER? code RV1 on raypak 2100 digital POOL HEATER? Alot of times they will do that because of a bad ignitor, which also serves as the flame rectification. Of the gas pressure to the main burners is too high. Usually, if its a sensor fault its a sensor fault, it would throw a code. Another culprit is a faulty pcb. How old is YOUR HEATER . Early 2100's had a pcb and honeywell ignition control module. Then they came out with the pcb that had the ignition module on board. The first series was rv0. That would show when you turn the heater off and back on(power) the next revision was rv1 and in the last few weeks they jus released another board that's a crossover from their low nox unit.Yours is RV1. If it is cycling on and off. It could be the pcb or the bypass in the header is stuck open letting it think its getting up to temp or the unitherm is stuck shut. Both of those conditions can make the sensors think the flow has reached temp. Does your unit hav metal or polymer headers? That is an easy change, but all raypak heaters 400k btu and under have some sort of bypass to help regulate flow through them. Well normally if it a sensor giving a bad signal there would/should be an error code. Turn off the gas. Inspect the blue wire that leads to the ignitor. If you can't find anything wrong with the blue wire, bottum right side of the heater inside by the burner tray there is a 5/16 bolt that holds the pilot bracket in place. Remove the bolt/screw and gnetly wiggle and pull the pilot assembly back towards you and then down. You will have to maniplulate the pilot tube while doing that. Its soft aluminum so it has give, just don't kink it. Now with the pilot assembly in view turn the heater on, remeber gas off, and see if the spark is reaching. Also, remove the 4 screws on the side off the display panel and pull it up and forwards and make sure the blue wire is properly inserted in the ignition coil on the heater. At this point we have 2 items that can be the issue. A bad pilot assembly of a bad board. Towards the bottum, about 2 inches up from the inside bottom, on the far right side is the pilot bracket. Its being help in by a 5/16 screw. The aluminum pilot tube and blue igniton wire got to the same place so If the blue wire is routed odly, then follow the aluminum tube. youre going to need a 7/16 wrench to loosen the pilot tube at the gas valve, unless you feel comfortable with making some small bends to the soft aluminum tube while you manuver the bracket and pilot out. 1= loosen and remove tube from gas valve. 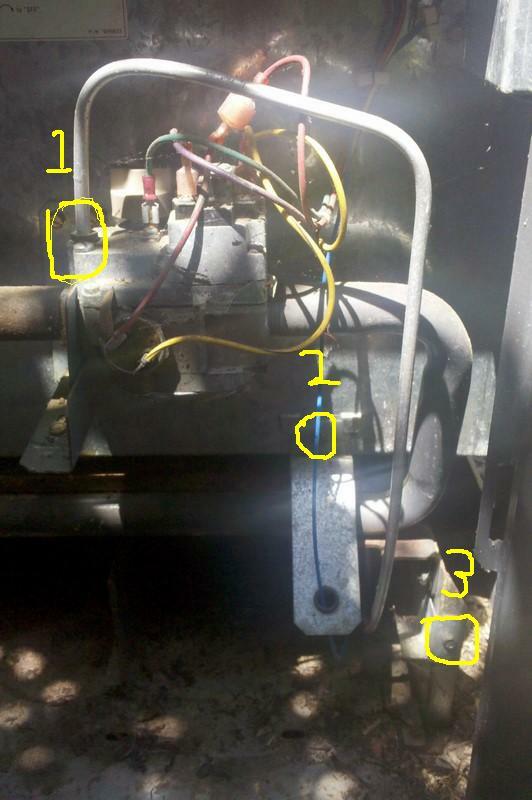 2= I didnt circle the blue wire, the metal flap that the wire goes through has a 5/15 screw holding it to the heater, remove that. page number 34,35,36,37 are troubleshooting pages. Labels: code RV1 on raypak 2100 digital POOL HEATER.